The great-granddaughter of Henry VII through his younger daughter, Mary Tudor, Jane Grey was a first cousin, once removed, of Edward VI, King of England and Ireland from 1547. In May 1553, she was married to Lord Guildford Dudley, a younger son of Edward’s chief minister, John Dudley, Duke of Northumberland. 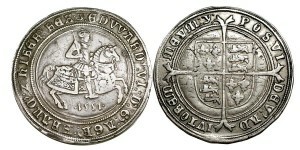 While the 15-year-old king lay dying in June 1553, he wrote his will, nominating Jane and her male heirs as successors to the Crown partly because his half-sister Mary was Roman Catholic while Jane was Protestant and would support the reformed Church of England, whose foundation Edward claimed to have laid. 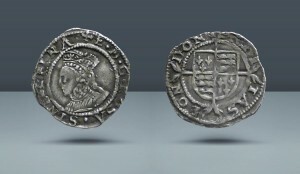 Both Mary and Elizabeth had been named illegitimate by statute during the reign of Henry VIII after his marriages to Catherine of Aragon and Anne Boleyn had been declared void. The will removed them from succession. This step subverted their claims under the Third Succession Act. Support for Mary grew very quickly and most of Jane’s supporters abandoned her. The Privy Council decided to change sides and proclaimed Mary as queen on 19 July 1553, deposing Lady Jane. Her primary supporter, the Duke of Northumberland, was accused of treason and executed less than a month later. Jane was held as a prisoner at the Tower and was convicted of high treason in November 1553, which carried a sentence of death, though Mary initially spared her life. After her father, Henry Grey, 1st Duke of Suffolk, became part of Wyatt’s rebellion of January and February 1554 against Queen Mary‘s intention to marry Philip of Spain, Jane was viewed as a threat to the crown; both Jane and her husband were beheaded on 12 February 1554. 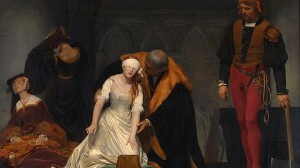 Lady Jane Grey had an excellent humanist education and a reputation as one of the most learned young women of her day. A committed Protestant, she has posthumously been regarded as not only a political victim but akin to a martyr.